With the Oscars this evening, this week I decided to watch one of the previous winners of the Best Documentary Oscar – 2004’s Born into Brothels. 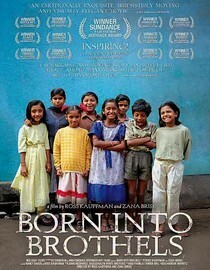 Born into Brothels is a cinema verite documentary about a group of kids, who are the offspring of prostitutes in Calcutta. The film focuses on the director’s efforts to give a better life to these kids, which includes teaching them photography and getting them enrolled in better schools. I though that the documentary had a somewhat slow start and I found myself dozing off during the first half (which was annoying, considering the fact that the bulk of the film is subtitled). However, as the second half got more into being about the well-being of the kids, I found myself paying more attention. Overall, it was a decent enough film.